A different way to prepare pumpkin, as thin slices marinated in ginger and rosemary. Thinly slice the pumpkin (a potato peeler is a great help) and toss it into a marinade of extravirgin olive oil, salt, pepper, rosemary and grated ginger. Let it sit in the fridge for 24 hours, then remove the rosemary. Combine all the ingredients, season with salt, pepper and oil and serve. 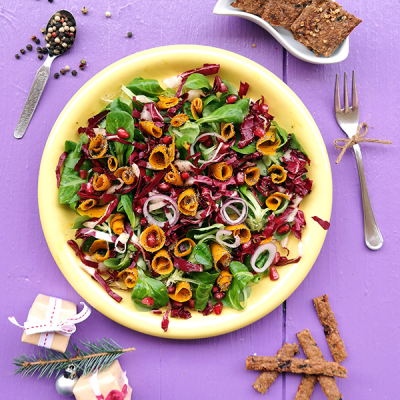 Marinated Pumpkin Salad is excellent with Black Olive & Sundried Tomato Crackers.